Oil on linen, 62 x 54"
Traywick Contemporary is pleased to announce a solo exhibition of recent work by Bay Area artist Amy Kaufman. 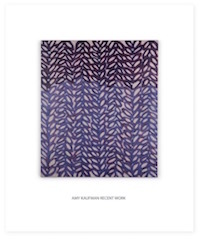 Represented by Traywick Contemporary since 1999, Kaufman will present new paintings and works on paper which showcase her commanding formal abstractions. Whether using charcoal, pastel or paint, Kaufman builds her compositions with repeated patterns of intertwining curvilinear lines, explicit and implied organic forms, and irregular geometric shapes. Energetic forms float in the foreground and simultaneously recede into the background to create the illusion of three-dimensional space. Bold shapes dominate the pictures; while soft edges and layered brushstrokes demand close attention and prolonged viewing. Kaufman’s work is rooted in a formal art practice and a working knowledge of art history. Her bold color choices are often inspired by a range of sources, from Persian miniature paintings to old master artists such as Velazquez, Caillebotte, and Degas. While observing a rigorous studio approach, she is also thoughtfully engaged with the world around her, from which she gathers the forms and shapes that appear in her work. 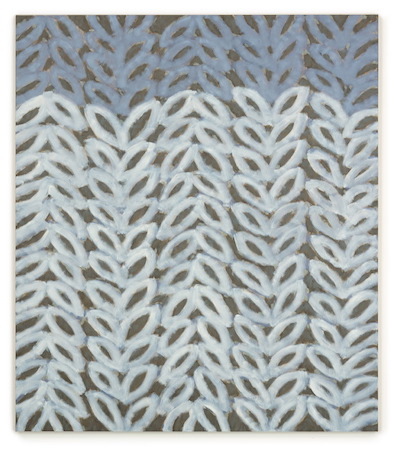 Kaufman’s “Street Repair” series feature meandering lines with haphazard patterns, variations in thickness and an awkward fluidity; while paintings like Ozone feature a hazy color palette with an irregular repetition of leaf-like shapes that flutter up and down the canvas. In her new body of work, Kaufman paints with a slightly looser approach in which brushstrokes are more evident, imperfections in lines are celebrated and overlapping colors are intentional. She successfully merges subject and process by maintaining a careful balance between order and disorder, motion and calm, and positive and negative space. Amy Kaufman has exhibited her work extensively over the past thirty years. Kaufman received her fine arts degree from the California College of Arts and Crafts in 1990. Her work is included in numerous public and private collections including the Fine Arts Museums, San Francisco, CA; Hammer Museum, Los Angeles, CA; Berkeley Art Museum and Pacific Film Archive, CA; Crocker Art Museum, Sacramento, CA; San Jose Museum of Art, San Jose, CA; The Fogg Museum, Harvard University, Cambridge, MA; Yale University Art Gallery, New Haven, CT; Weatherspoon Art Gallery, Greensboro, NC; Mills College Art Museum, Oakland, CA; Monterey Museum of Art, Monterey, CA; and United States Embassies in Hong Kong and Singapore.